Firefighting. If we split this word, we find “fight”. And indeed, it is a sort of war that is fought against fires: infantry and ground troops, paratroopers jumping in remote areas… And, of course, attack aircraft, named water bombers and sometimes made from ground attack planes, which are guided by observation planes to provide ground firemen with something similar to close air support. The weapon is of course water, either pure or mixed with additives to turn it into foam or gel, or special fire retardant products. The choice of the weapon has a critical impact on its efficiency, but the way it comes to the ground is just as important: direct attack right on the flames has a blast effect that blows the fire; a semi-direct attack, starting to drop the product just in front of the flames, produces less blast but makes the vegetation slower to catch fire; and an indirect attack means dropping retardant ahead or aside the fire to prevent it from spreading. A good dropping mechanism should be perfectly fit to at least one of these strategies, if not all three of them. This is the most obvious system. The tanks include segments, each segment being held by a single door. The carrying vessel (or vector) can make as many drops as there are doors, or heavier single drop by releasing all doors at once. With a four-door system, we can make one full drop (1+2+3+4) or four separate drops (1 – 2 – 3 – 4), but also two half-loads (1+2 – 3+4 or, if the system allows it, 1+3 – 2+4 to get a wider coverage). In the first case, the massive fall produces a heavy blast, but in the second case, it makes a longer and thinner ground imprint, and other combinations make for intermediate effects. Now, imagine the complex possibilities using the 22 doors in the Martin Hawaii Mars! 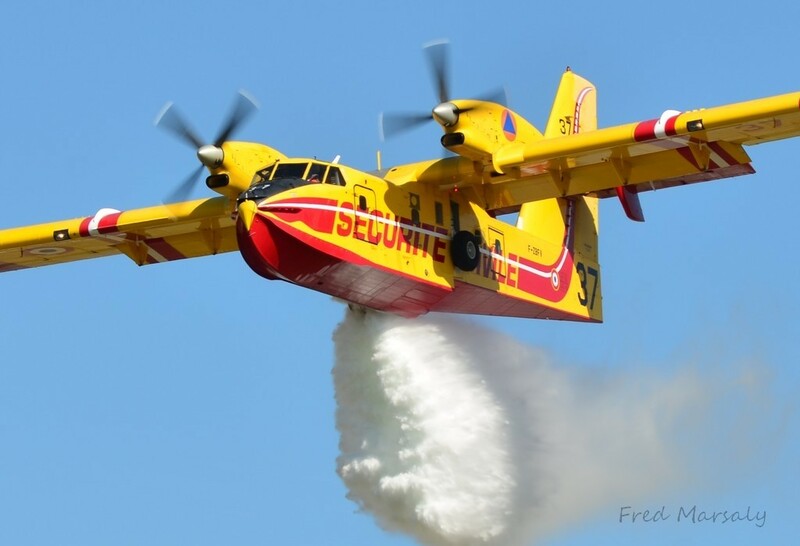 This French Sécurité Civile’s CL-415 is dropping an half tank (3000 liters or 790 UsGal) with only two doors open on its starboard side. This simple conception is very reliable and very efficient for direct and semi-direct attack, to which it is perfectly suited, though it can also be used for indirect attack with acceptable efficiency. It is found on flying boats like Canadair CL-215s and CL-415s, Beriev Be-200s or of course Martin Mars. Many tankers also rely this mechanism, for example most Lockheed P2V Neptunes, Grumman Trackers tanked by Conair and Douglas DC-7s still operating, and many helicopter kits operate on the same principles. Four doors tank from a Conair S2FT Turbo Firecat in French Sécurité Civile service. 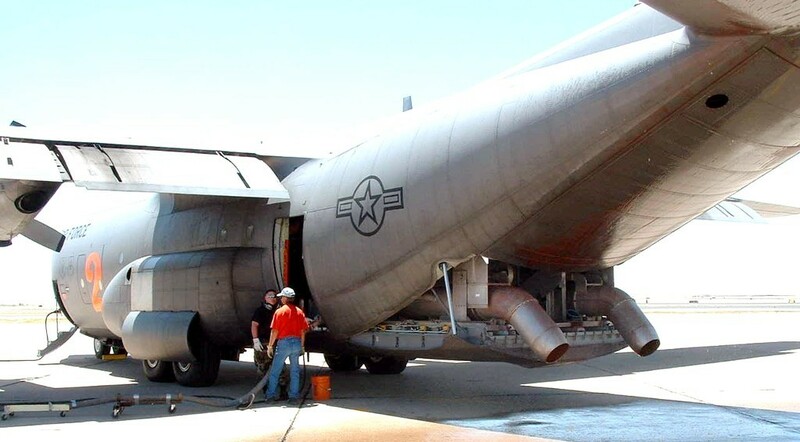 Conceived and developed by Aero Union in the late 80s for their own Lockheed SP-2H (called “Firestar”), constant flow tanks were later designated RADS (for Retardant Aerial Delivery System) when the system was sold for the Lockheed C-130As operated by TBM, Butler and T&G. This principle then set a trend and was produced by several other operators. 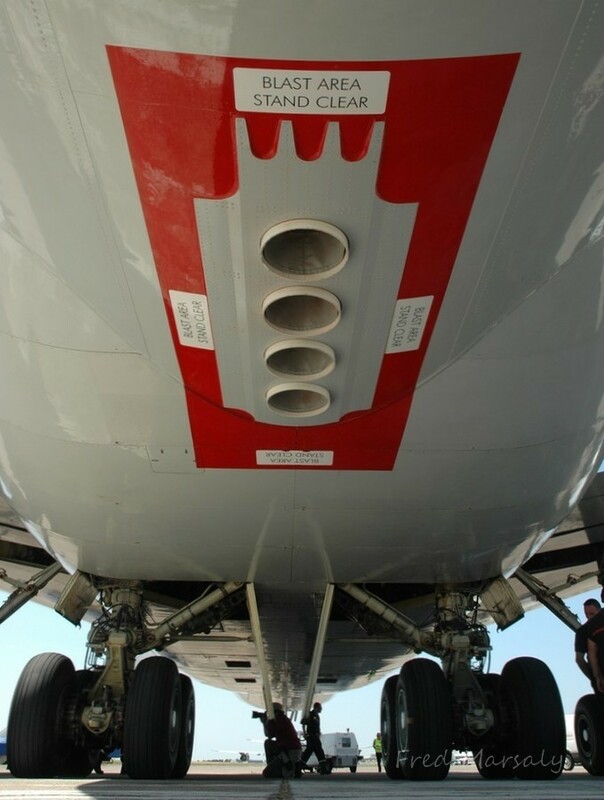 Its principle is similar to the traditional gravity tank, but a constant flow tank segments are only meant to steady the load and prevent shifts in the aircraft’s center of gravity. There are only two doors covering the whole tank and allow partial opening, so as to regulate the liquid flow falling down. Instead of setting how many doors should open for the next drop, the pilot using a constant flow system sets two commands, the total amount of product to be dropped and the wanted concentration on the ground. Then, the integrated computer calculates how widely and how long the doors should remain open. Sécurité Civile’s Q400MR Fireguard tank and its Constant Flow two doors system. According to experts, the constant flow doors are the most reliable and effective system currently in operation. 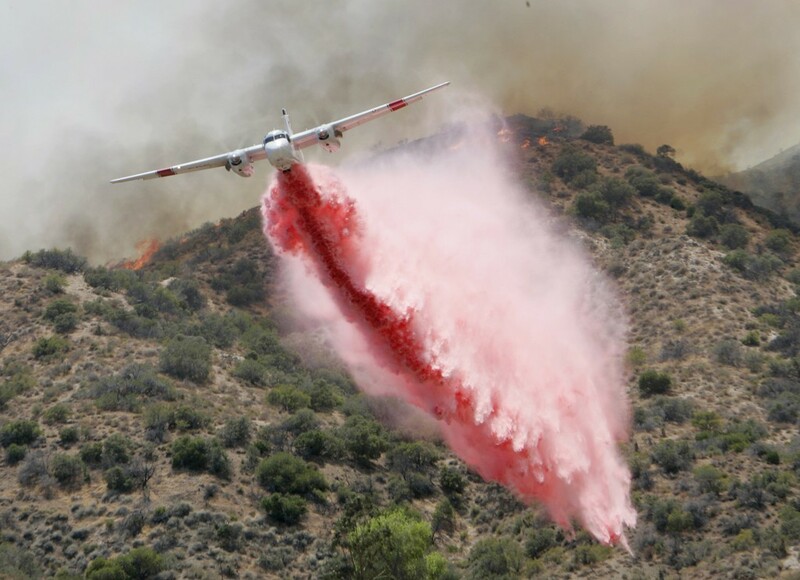 It is simple, efficient and most of all versatile: selecting a high coverage level and a huge quantity of product, it can make heavy and decisive direct or semi-direct drops; but using a lower coverage level allows to create thin and long retardant lines that act like a firebreak. Constant flow tanks are now widely used with many different installations: they can consist in fixed on-board tanks or removable devices, completely or partially integrated in the fuselage or just hung outside. Some equipment keep the original abilities of the aircraft, making them multi-purpose, as the removable inside tanks of the Lockheed Hercules (both C-130 and L-100) cargo planes from Coulson Flying Tankers and the external ones found under the Bombardier Q400 liner planes in service with the French Sécurité Civile and the Erickson Aircrane heavy helicopters. Other aircraft use fixed constant flow tanks, as Douglas DC-10s from 10 Tanker, McDonnell-Douglas MD-87 from Erickson Air Tankers, Lockheed Electras from Air Spray, Convair 580s and Avro RJ85s from Conair. 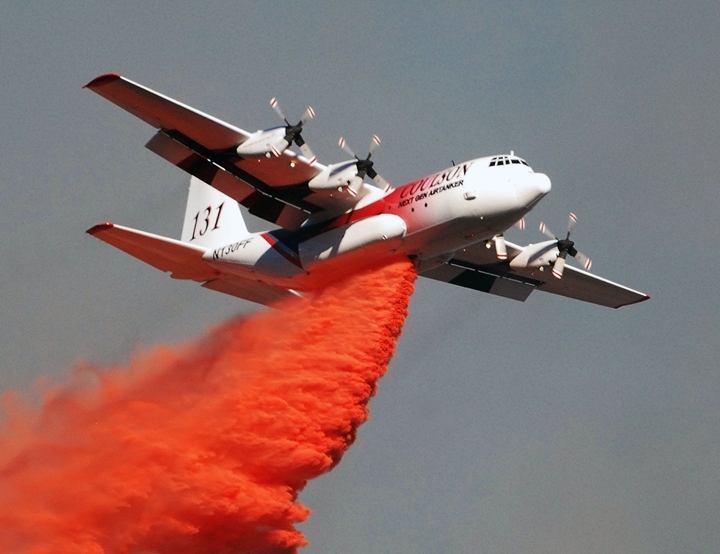 It also fits lighter planes like the Grumman Trackers used by the Cal Fire; Air Tractor AT-802Fs and Fire Bosses also used that kind of mechanism, named Fire Retardant Dispersal System. It could also be fitted to flying boats and, provided this project gets real, constant flow tanks should equip the firefighting version of Japan-made ShinMaywa US-2. Pressurized dropping systems were born in the 70s, when FMC Corporation conceived the Modular Airborne Fire Fighting System (MAFFS) which were later produced by Aero Union. It was actually an adaptation of the system used to spray defoliant and herbicides during operation Ranch Hand in Vietnam: its principle is to pressurize the liquid inside the tank so that it flows more rapidly, giving a higher product density on the ground. 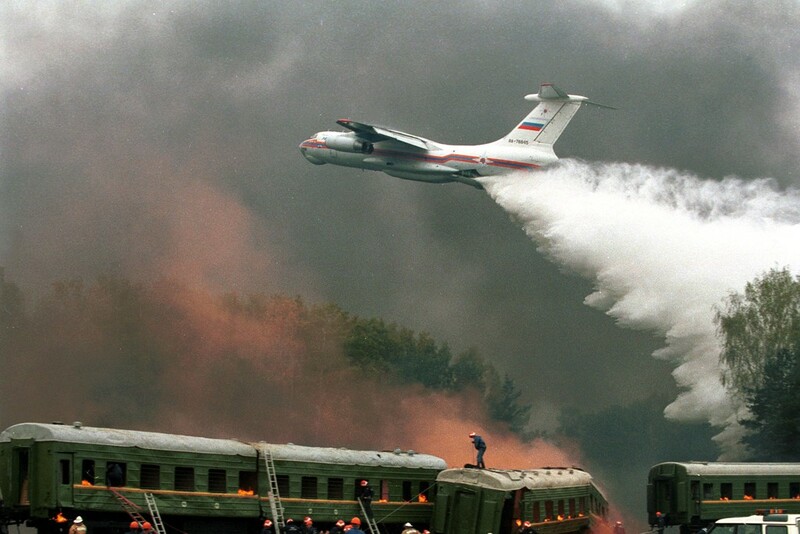 This was necessary as the request for proposals required that no modification should be made to the carrying plane for the firefighting device: the flow obtained by just pouring liquid through the rear ramp wasn’t sufficient and the only way to get an efficient drop was to pressurize the tank. On MAFFS 1 (which uses two nozzles through the open ramp door), the tank was pressurized on the ground, during the retardant loading. 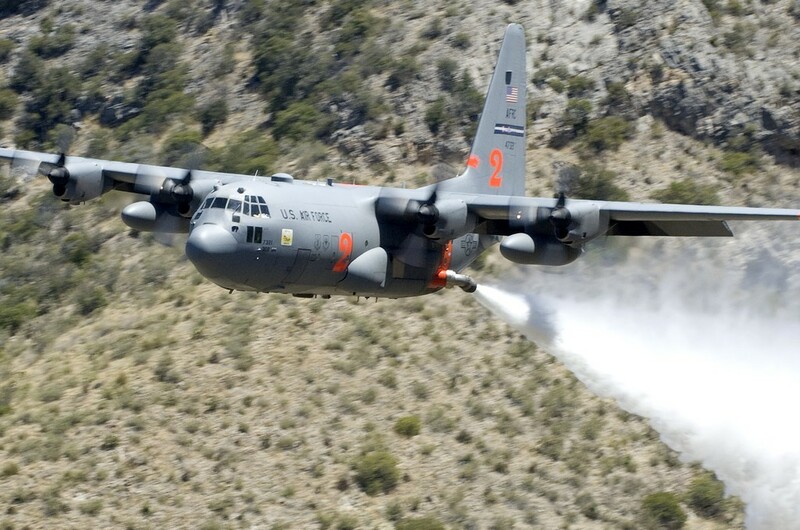 The MAFFS 2 update, in the late 2000s, included its own compressor, allowing the pressurization to occur in-flight (it also uses only one nozzle, through the side door, so the plane remains closed during operations). The MAFFS platforms are mostly used in Lockheed C-130 Hercules, but they are not the only pressurized system: the same principle has been used on Evergreen’s Boeing 747 Supertanker (4 nozzles in the belly, behind the wing). 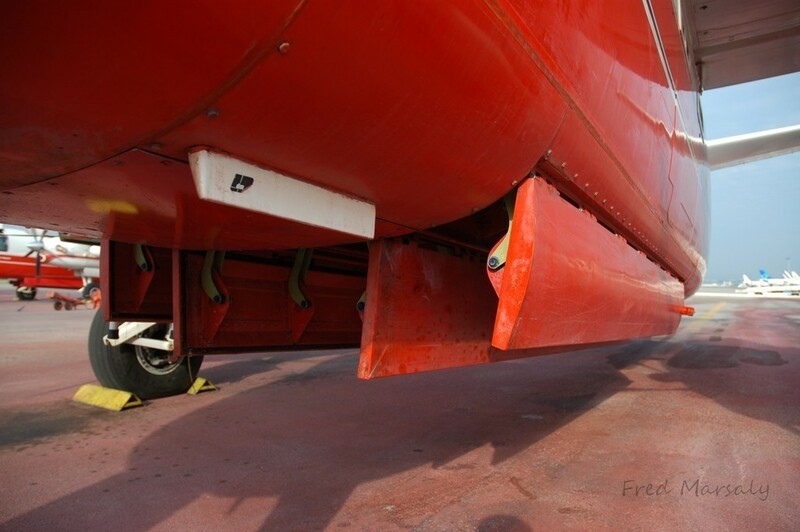 Evergreen Supertanker drop system’s four nozzles. 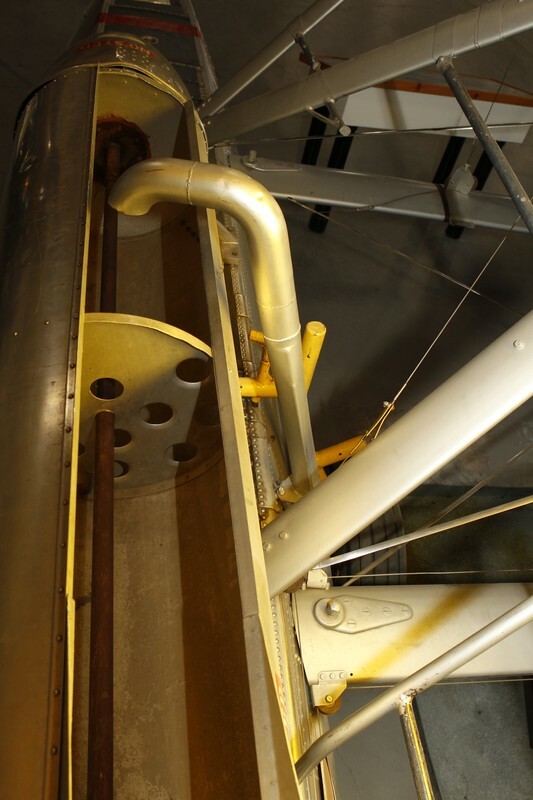 Pressurized systems share several limitations. The first one is the waiting delay before the tanks pressure is high enough: it makes MAFFS 1 systems remain on the ground several minutes, and requires other planes to fly long enough before a drop can be made. The small diameter of nozzles implies a narrow line, which can be a problem, and even with pressurization the maximum concentration level on the ground is lower than that obtained with gravity tanks. The slower dropping rate also means it takes longer to make a full drop in case of emergency, and it is not possible to obtain a blast effect for direct or semi-direct attacks: pressurized systems are better-suited to indirect attack using retardant product. 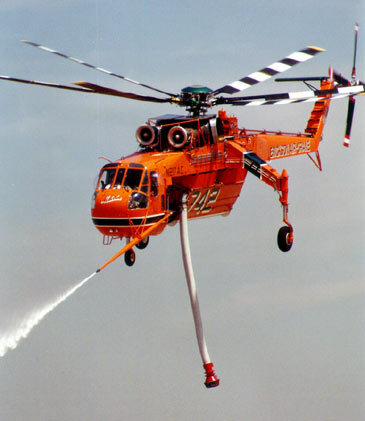 A similar system can also be fitted on Erickson Aircrane heavy helicopters: a fire hose can connect to their 9000 liters RADS tank, allowing a near-perfect accuracy. This technique can be useful against forest fires, as well as urban or industrial fires; it is, though, not used often and even rarely installed. Karman also announced that their K-Max, which can carry a Bambi bucket (see further) or a specific drop system to fight fires, could be equipped with a similar device. In the same spirit as the MAFFS, a simpler design has been made using unpressurized tanks, the liquid flowing through nozzles thanks to gravity. It keeps most limitations of MAFFS, but is simpler to operate with no delay for pressurizing the system. Not widely used, its major application is the 45 tons VAP-2 platforms installed inside Emercom’s Ilyushin Il-76s. MBB also conceived a smaller device for the Transall C-160, used in Germany and mostly in Indonesia. Much more popular is the helicopter bucket, informally called “Bambi bucket” after the most famous models. 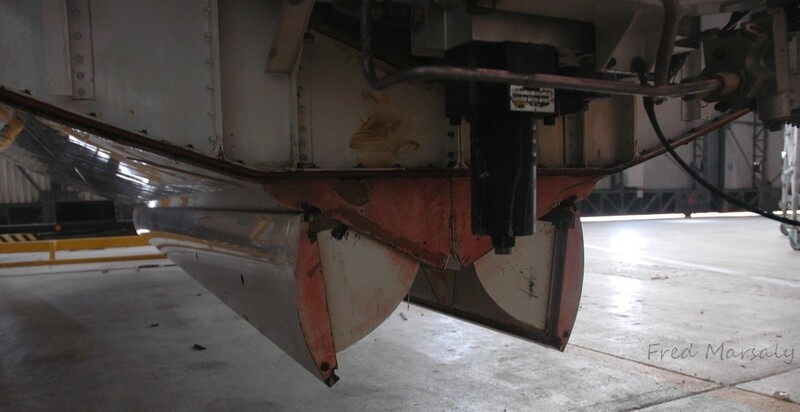 Bambi buckets are hooked under an helicopter; they can be filled in a matter of seconds by laying into a lake, and drop their content the same way as a simple gravity tank. Different sizes exist, from 300 to an impressive 20’000 liters for the Russian heavy helicopter Mil Mi-26! Very simple and practical, the Bambi bucket suffers of a high sensitivity to wind, like any kind of sling load. Its efficiency depends on the vector’s capacity but heavier models have proven quite versatile. Good abilities associated with reasonable costs and operating simplicity made Bambi buckets very popular all over the world. 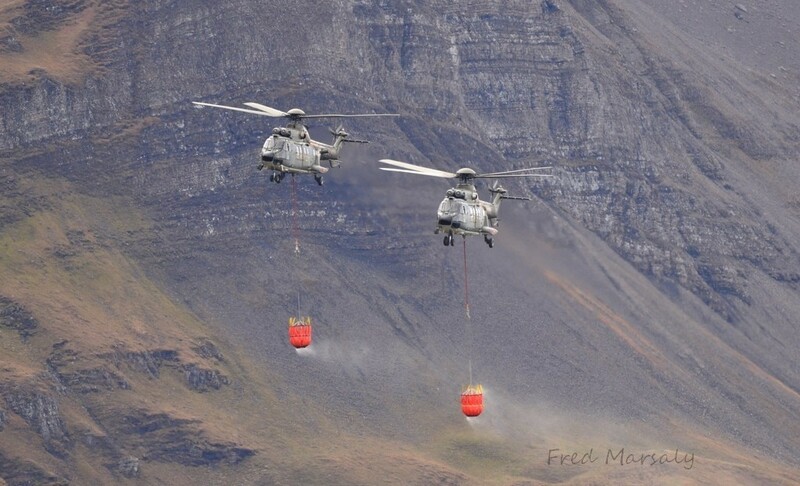 Bambi Bucket and similar systems are adding versatility for firefighting to these Swiss Air Force Super Puma. The opening can be rotated up to fill the tank and carry water, then down to pour it over the flames. 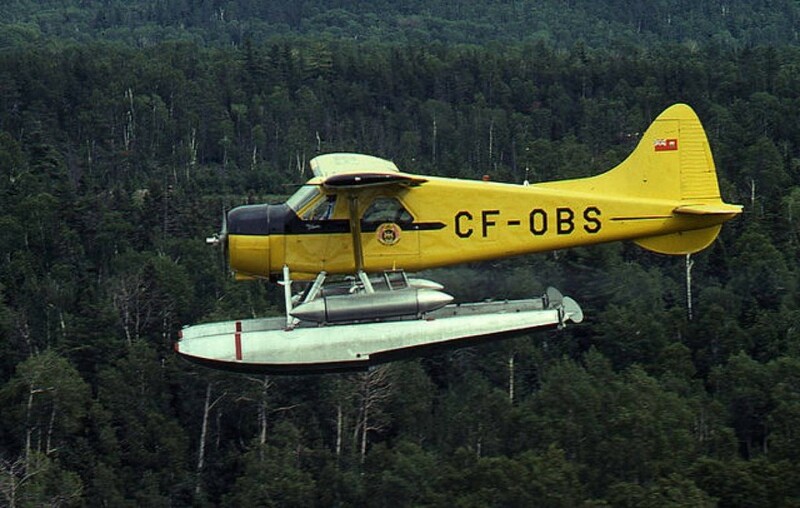 This archaic system had arguably small capacities, but it was used on De Havilland Canada Beavers and Otters for years; it was superseded by central tanks fitted with doors. Other, even more peculiar systems were also considered: for example, a giant watering can was patented in the USA during the 1920s. We really wonder why it was never mass-produced… or not. In the 1920s, pioneers tried to drop bags filled with water to put out fires. They were not successful, but lately the industry seems to have new thoughts about packaged liquid drops. The Precision Container Aerial Delivery System, also known as Caylym Guardian, is made of cardboard boxes, each containing 1’000 liters of water or retardant. The boxes are then dropped from the rear ramp of a standard army cargo plane such as Lockheed C-130 Hercules, Alenia C-27 Spartan, Antonov An-26, Boeing C-17 Globemaster III or Airbus A400M, and open mid-air to release their product. The major drawback of the PCADS is it cannot make an homogeneous retardant line in indirect attack. It also can be a danger for goods or people on the ground in case the box don’t open correctly and it gives the fire some fuel – although a few pounds of cardboard is not a big deal in case of a huge fire. On a more positive side, it should allow an accurate release and be quite efficient for direct attack, though there is little practical information at this time. PCADS also has some undeniable advantages. Since the boxes open mid-air, it is possible to drop them from a higher altitude, which offers safer operation. It is also very cost-effective: it doesn’t need any modification to the cargo plane and the affordable boxes can be stored for years until needed. Therefore, this system fits well nations which only have big fires once in a while and wouldn’t afford an expensive specialized equipment. It is currently in operation with the Romanian Air Force, which uses Alenia C-27J as a vector. Another example of packaged drop is the Hydrop, made by Elbit Systems. It consists of light biodegradable 200 ml bags, this size being the best compromise between mass, practical considerations and safety of goods and people on the ground. It can be used in any carrying system, either in planes or helicopters, and bags can carry water, gel or retardant. Its major drawback is it needs a special equipment to fill the many little bags, which means costs and operating constraints. 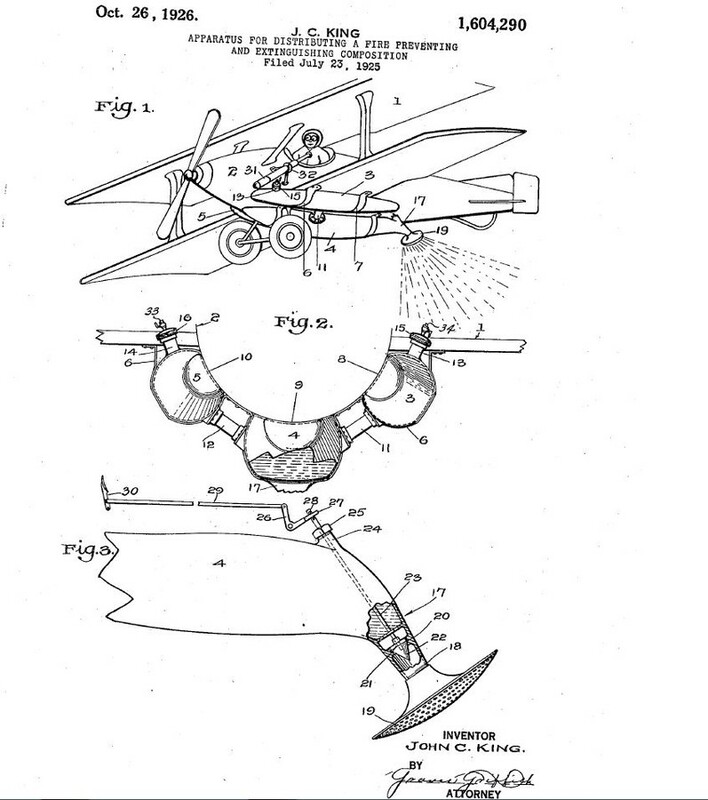 Yet, it allows higher drops for better aircraft safety, which its inventor says should allow night operations, and keeps an homogeneous ground imprint. 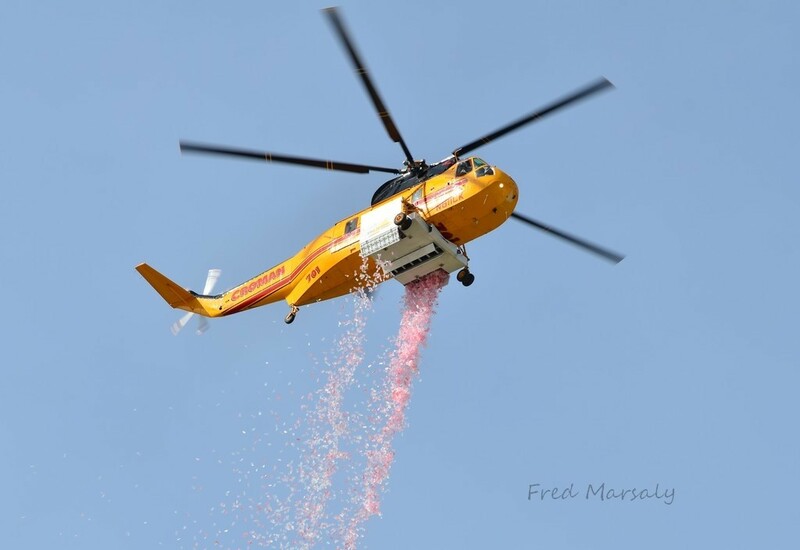 Demonstrations were made in 2014 from a Sikorsky S-61, belonging to Croman and fitted with a special tank; there is no evidence of operational applications since then. March 2014 Elbit Systems Hydrop demonstration drop from a Croman S-61 in Sacramento. Discussions about the best water bombers usually limit to speed and supposed agility of aircraft, as well as the quantity of product they can carry. The very nature of the product and the system that delivers it are often forgotten; however, reliability and versatility can be important points, which impact both operational and commercial aspects and sometimes explain the wide adoption of some aircraft. To come back to the military analogy, the characteristics of the vector are one thing, but those of the weapon and those of the mechanism that delivers it are just as important. And when all three assets come together, fire quickly cools down. Ce contenu a été publié dans Fighting Fires par Fred Marsaly. Mettez-le en favori avec son permalien.